Imagine a teenager walking into 7-11 and picking up a bag of Lay’s Potato Chips instead of Flamin’ Hot Cheetos. The chips have three ingredients – potatoes, salt, and oil. On the other hand, the Cheetos are coated with 20 chemicals to make them “Flamin’ Hot.” While some think the jump from eating junk food to an apple is the best way to improve health, there is also a tangible impact from choosing less processed foods with shorter ingredient lists. What if we harnessed the power of education to teach kids and adults to vote with every dollar in the convenience store and grocery checkout aisle? What if we demanded that processed foods use better and fewer ingredients? And what if we all knew what to look for on ingredient lists and nutrition labels to make the best choices for ourselves and our families? Food and Nutrition is a complex topic, and others found these selections from the Impact Giving archive from Giving Compass to be good resources. Americans’ hunger for healthier, more sustainable food options continues to grow, and a good food marketplace is maturing to meet it. Donors and impact investors can help grow that market, and thereby a better food system for all. For the last two years, I’ve argued in multiple venues that one of the keys to improving Americans’ health, cleaning up our environment, and creating a more equitable society is cultivating a good food system—one that makes delicious, nutritious, sustainably produced food accessible to all. I’ve also argued that creating such a system will require both traditional grant making and the use of financial investments that feed good food businesses and help grow a better food marketplace even as they generate returns. Along the way, I’ve discovered many opportunities for donors and investors to get involved and help build a better food future. Here are three of them. Food is personal—it’s what connects us to our cultures, memories, and each other. Workshops are just the beginning—change happens through consistent follow up, comprehensive resources, and ongoing engagement. We face a major public health crisis that is increasing at a growing, and deadly, rate. Diet-related disease is killing people much faster than cigarettes ever did and making us sick along the way. According to the U.S. Department of Health and Human Services, more than two-thirds of adults and one in six American kids are obese. About half of all adults living in the United States have at least one preventable diet-related disease, including high blood pressure, type 2 diabetes, heart disease, and certain cancers. And the costs associated with treating these diseases is astronomical, totaling hundreds of billions of dollars in medical bills and decreased productivity. We’ve already seen Big Food respond to consumer demand in the marketplace. Nielsen research reports that more than 50 percent of U.S. residents consider the absence of artificial flavors and colors to be an important part of their food buying choices. Because of demand, a growing roster of food companies and brands are cleaning up their ingredient lists, and we can use direct education to keep the flywheel turning faster. The Seattle-based Beecher’s Foundation is building a better food future through a pair of food education programs. 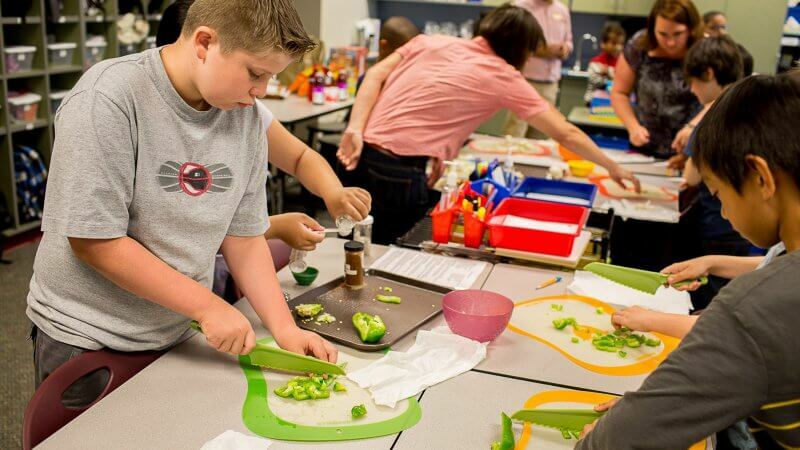 Since 2006, more than 100,000 4th and 5th grade students in Seattle and New York City have participated in the Pure Food Kids Workshop, commercial-free, common-core learning standards-aligned food education class. The 2.5-hour program is free to all schools, and empowers students to become “food detectives.” They’re equipped with the tools to make healthy choices for life through learning how to read nutrition labels, understanding ingredient lists, and identifying marketing tactics used on packaging to sell food to kids. The Beecher’s Foundation also operates the Sound Food Uprising Workshop, a course offered to adults across Puget Sound. The 2-session workshop explores the problems in today’s food system and the power we have as individuals, family units, and employee peer groups to change our food environment for the better. Programs like these inform and spark curiosity—and don’t tell people what to eat. Food is personal—it’s what connects us to our cultures, memories, and each other. Workshops are just the beginning—change happens through consistent follow up, comprehensive resources, and ongoing engagement. We envision a world where none of us has to fight against the system to eat healthy and live well. In the world we want to inhabit, changes in demand have driven food suppliers to affordably offer more fresh and whole foods and fewer processed foods; home cooking is on the rise; and the curve has bent downward on rates of heart disease, diabetes, and other diet-related diseases. Support organizations that provide nutrition programs to schools, such as The Beecher’s Foundation. Connect with others in the nutrition space by volunteering as a youth educator or other healthy food-related role. Original contribution by Sara Billups, Director of Communications and Public Affairs at The Beecher’s Foundation. Photo by Erinn Hale. Food and Nutrition is an important topic. Other members found these Giving Funds, Charitable Organizations and Projects aggregated by Giving Compass to be relevant to individuals with a passion for Food and Nutrition.